Viola-S is a Holsteiner Bred Mare from the Netherlands. She was exported to Mexico in hopes of making the Pan American games there. She has an incredible hind end powering her intense desire to jump. We are pictured here getting our feet on the ground at our first show together. Open for 2020 Foal. She is available for breed lease or sale. Rivana was purchased as a 3 year old from Milestone Equine. Her cattiness, carefulness, and boldness as a three year old continued to be her predominant traits as I broke, trained, and showed her. She was successful in the International Jumper Futurity classes on the West Coast as a 5, 6, and 7 year old. Rivana had the heart and ability to take me, her amateur rider, where I never thought I could go. In 2008 we showed from 1.20 and 1.30 at Spruce Meadows to the 1.40 at Showpark in Southern California at the end of the year. She was retired in 2009. 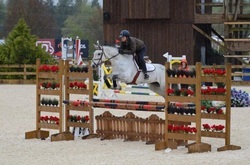 At the 2010 Holsteiner approvals she received a 57, Main Mare Premium. She has had 4 foals -Her first by Larrox Z is showing in the 5 year old YJC classes in 2016 and won his most recent class in Canada. 2012 gelding by ﻿Chacco﻿ Blue (Mecklenburg - 3rd Place 2011 Aachen Grand Prix, 1st Place Grand Prix of Neumünster- of Schockemohle Stud) is a wonderful young horse. Chacco sadly passed away June 2012 so this is one of his last foals and one of the few in the US. Click here for more information . This is my second Chacco Blue foal. See Chacaltaya on the "Foal" Sales horse page. 2013 colt by ﻿Diarado﻿ is a very impressive young colt with presence and excellent conformation. 2016 Colt by Capone is quite the character and exhibits his parents athleticism and boldness. Sadly we lost her in February of 2017. Click for Video of her as a 6 year-old at the Sacramento International Horse Show $10,000 Class for 6/7 year olds.